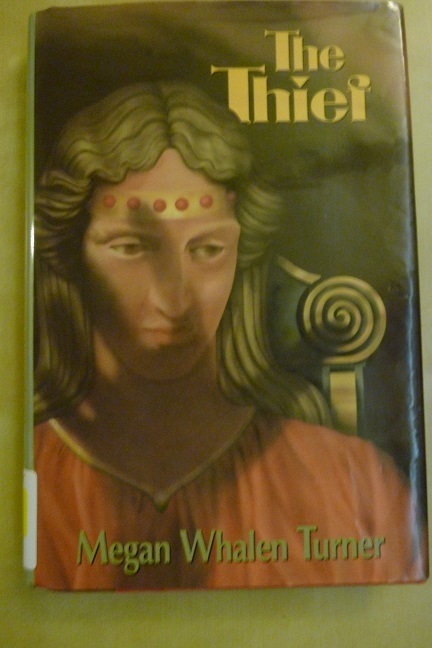 I’ve read The Thief by Megan Whalen Turner at least four or five times–and I feel like I see something new every time. The story is about Eugenides (Gen for short), who claims to be the greatest thief in the world. It appears there is only one thing he can’t steal–himself, out of the king’s prison. He finds his opportunity, though, when the king’s advisor, the Magus, selects Gen for a mysterious quest, with something to steal at the end. Joined by the Magus’ two apprentices and a body guard, the party travels through three countries and a landscape rich in mythology. Gen is a splendid protagonist, apparently a crude thief but with undertones of thoughtfulness and depth. He also has considerable pride in his art and a healthy belief in himself. He’s in some ways an unlikely hero–small, apt to laze and complain, and with few indications of the nobility and honor you might expect from a fantasy hero. But as I said…there’s depth! I don’t want to give too much away here–but Gen is also an absolutely brilliant unreliable narrator. He doesn’t lie so much as he omits…and sometimes he tells very revealing truths, but in such a way that the reader will most likely misread them and not learn anything after all. It’s so well-done that I’m not too worried about spoiling it, because I doubt even someone watching for it will be able to spot what’s really being said! Apart from Gen and the secret twists of the book, the best aspect is the setting–something I rarely say about a novel! The three countries of Sounis, Eddis and Attolia are clear and distinct. The book manages to paint the economic and trade situation for the three countries, and situate it in the picture of the larger world…none of which are things I would expect to find interesting, yet here are plot-important and easy to understand. There’s also the mythological landscape, which adds an extra layer. Gen and the Magis tell a few mythological stories along the journey–and eventually the gods come to have a very active role in the current story as well. The mythology is loosely based on Greek, but not in a one-to-one kind of way. For one thing, the head of the pantheon of gods is female! Despite the all-male traveling party we’re with most of the book, there are some strong women in here too, goddesses and humans. The Thief is actually the first book in a larger series…which is something I try to forget. I know there are people who love the rest of the series just as fiercely, but I simply don’t. I really, really tried–I read the second book TWICE. Unfortunately, I just can’t wrap my head around some of what happens to the characters later on–and especially some choices Gen makes. So far, I haven’t been able to bring myself to read the following books. However–I love the first book. Read it. Then go get some other opinions and decide whether to read the rest. I was horrified by what happened in The Queen of Attolia, and I hated that pairing. Still, I went on to The King of Attolia (I was encouraged by the 5-star reviews on Goodreads, which weren’t purely made of GIFs), and boy, did I do a full U-turn. This sounds good and I like that cover. Me too! It’s an old one you almost never see, and when I THINK about it, it doesn’t look a bit like Gen…but it’s the cover my library had, when I read this the first three or five times, so I’m attached to it. So interesting how people have different favorites among these books. For me: I liked the Thief, loved The Queen of Attolia, totally freaked out with super-love over The King of Attolia and enjoyed A Conspiracy of Kings. I’m not sure I’ve seen any other series inspire such intense and *different* reactions to its different books. Usually people like a series or not en masse. This one seems to have devotees to different parts of it. oh my gosh I am not fond of Queen of Attolia much myself, but King of Attolia is ONE OF MY FAVORITE BOOKS EVER and I do not cap, scream lightly. And five minutes after I read it the first time, I turned right around and read it again. Just saying. Hmm, well–you do kind of make me want to give it a try…which is not something anyone else has managed! Never heard of this but it sounds great and you’ve certainly piqued my interest. I hope you enjoy if you read it! I absolutely loved The Thief – and for the longest time I didn’t even know it was part of a series. In fact I’m not even sure I read the last two books. So I’m kind of with you (maybe I read the third book on second thought) because things get a little strange. I’m planning on reading the rest of the series, but I’d imagine The Thief will always be my favourite! I didn’t know about the series for a long time either–although I think the later books ARE more recent (and I’ve heard rumors more are still planned).